A week after my previous show, I was back co-presenting another Wrong Rock Show with Botha on Bush Radio. I joined Botha Kruger on The Wrong Rock Show for the first time to co-host my first show in just over a year. My Baby - Soo Coo? Spoiler Alert! : Sometimes I have other things to say. Proceed with care. Sometimes I have other things to say. This is not music related. Proceed with care. 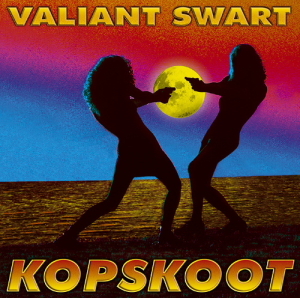 I sometimes wonder about how well Valiant Swart could be received in a non-Afrikaans speaking, and more specifically – a non-South African environment. On an intellectual front, I think he is too often misinterpreted or lost between the likes of Koos Kombuis and Ralph Rabie [Johannes Kerkorrel], both who have achieved somewhat iconic status as musical / poetic masters. I think that it is quite tragic that he hasn’t got quite the same status – but it’s probably a blessing in disguise. Although he has gained huge popularity, Valiant has managed to keep his feet on the ground and has continued to write songs that are real. Not confused poetry or polished whateverisms. Thankfully, his skills have remained where it mattered. Valiant had been hard at work for many years by 1997. Performing at probably every opportunity given – and taken. Two albums where released during that year. Together they covered much of what the Valiant Swart Band had entrenched as performance repertoire by this time. The second album is ‘Kopskoot’. It covers what was at that time his more recent work. Some of the songs are a little scrappy. But that’s only compared to his own work. Valiant and producer Jurgen Von Wechmar at Sunset Recording Studios continued to work together through the years and eventually got it just right. Valiant remains unique by being ordinary and unpretentious. His ability to make spoken language flow and sparkle is magical. Although he writes (and therefore sings) in both Afrikaans and English – his language is distinctly South African. The lyrical intricacies, however, make Valiant Swart’s work a little hard to write about. A listening session would be more appropriate, but I will to do a little run-through nevertheless. The album kicks off with a reckless and simple ‘Syber Sakkie’. It has a careless edge that always made the band a pleasure to watch live. Guitarist Anton L’Amour is frenetic. ‘Tjank Stations’ has a similar style, but is marginally more sophisticated. ‘Almal Maak Haar Mal’ is a wonderful biographical description and touches on the frustrations of real-time Stellenbosch student-life issues. Stylistically, ‘Oorlede Lettie’ is an early take on a Country / Elvis Presley theme that would reoccur in later work. On this album, parts of the vocal delivery on ‘Anyway, Alex Jay’ show more of Swart’s love for Elvis. This song is a simple anecdote based on a plane trip with Alex Jay – at that point a hugely popular radio personality - as a co-passenger. ‘(You Can’t) Fax Me Your Love’ has always been crowd favourite. The dilemmas of loveless technology – at that point still a fax machine. ‘Jacaranda’ is a reference to Pretoria, and offers more lyrical magic. I recently read somewhere that there are plans to rid Pretoria of its Jacaranda trees. How tragic. ‘Slawereen’ is one of those tracks that bring out the melancholic side of Swart. It’s pensive and African. Swart’s guitar playing is often reminiscent of Mark Knopfler. Just with a little more earth. ‘Mama Blues’ takes a trip to a land of slow and careful blues. ‘Hi-Fi Op Stand By’ is about how easily some lekker music can change any gathering into a party. Student life’s greatest moments. The solos are sublime. Some of the word-play in songs like ‘Wanda’ would be almost impossible to translate effectively (to any language). The interplay between words and meanings are just too precise in Afrikaans. ‘Soos ‘N Vis’ is pure poetry. One should be reminded that the power of the musical contribution wonderfully disguises that poetry, keeps it balanced and increases its longevity. Wow. You should really have a listen [again]. ‘Onna Cheeck’ is a wonderful excursion into reggae with a solid bass-line delivered by Casper Malherbe. Lyrically, ‘Droomrivier’ is one of Valiant’s most enticing pieces. Set against a solid, driving, pounding beat that leaves you rather dazed when it’s over. I usually wish it would just go on forever. ‘Kake Van Die Leeu’ was also a huge crowd-participation moment at gigs. Clever lyrics and a thumping back-beat. ‘International Maria’ has long been one of my favourite songs. It soars and soars with an endless flow of [often almost bitter] memories of another truly South African dilemma: the effects of the fear of a dark and scary Africa. Many white folks had left the country. Some didn’t. There are no specific references to politics and no agendas. The references are to real life issues that can only be properly understood if you know enough about the time-frame during which the songs where written. At live performances, this song usually closed off proceedings in total musical mayhem and anarchy. It was beautiful. Yes, and I almost apologise – it sounds a bit like an ingredients list. In a way I suppose it is. Have you ever eaten the raw ingredients of your favourite [non-raw] dish and thought: “Oh, Yum…”? In short: Slightly scrappy but fun album underlined by brain-tingling lyrical magic. 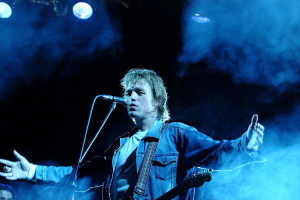 And if you don’t ‘get’ South African – it’s still great rock and roll. Good for parties. And poets. And perfectly pot-roasted potatoes. Worth all your memories of Stellenbosch in the early Nineties. Album cover images and images of artists are used for illustrative purposes. Any objections to their use can be forwarded to me - the author of this blog. All writing is subject to copyright protection. Go figure.